Find a moment and recharge the consciousness. Absorb the sound radiance, letting the mind rest from daily responsibilities. Simple and pure energy, diffused and saturating the world around us. Bright like the color of our star, Lily Tapes and Discs has provided sonic recuperation for all. A beautiful split cassette between Jason Calhoun as Naps and Ben Lovell veiled as Lung Cycles. The A and B sides perfectly balanced and fantastically rejuvenating. The sustained tones on the Naps side are rich with depth and emotion. There is nothing dark or looming, only a feeling of being focused in the center. Amazingly there are many adverse reactions to drone music. On brief samples, the sounds are the same, the journey does not go anywhere, and this composition is not music. All things said when this genre is being played. If only more people could understand, depart from thoughts and let these low cycle per second sound waves permeate their spirits. There is a softly fluctuating allure to Jason Calhoun's sound. Like the motion of celestial bodies, still when looking, but moving more than most can grasp. This is the connection that remains elusive. It is very gratifying to know these melodies are being created. This is equally true for Ben Lovell and Lung Cycles. His approach is more grounded in the physical. Using an improvised pipe organ, his three tracks conjure images of the homage to spirituality. An instrument dating back over a thousand years, played with an evolutionary understanding. Like Naps, Lung Cycles uses melodic drone, bathing the consciousness in cathartic hertz. Small changes in frequency, creating an ancient story of so many living throughout our time. Ben's side is slightly more haunting, a touch more lonely. A delightful foray into the spiritual framework. Released on Lily Tapes & Discs in a hand numbered edition of seventy five. Printed by Jeremy Ferris on Brad Paks from Stumptown Printers. Art work by Benjamin Torrey. The mastering was done by Lucas Knapp. As described, sounds by Jason Calhoun and Ben Lovell. A lot of work by talented people went into this release. The final product really exudes this. Chihei Hatakeyama is like peridotite in the world of ambient serenity. The heavy for creating the most weightless tranquilities. With a massive amount of material including compact discs, cassettes and vinyl, this is Chihei's second cassette for Constellation Tatsu in the last few years. When the label decided on the mood and feel of the 2018 Spring Batch, Chihei Hatakeyama must have been the clean up batter for the line up. This composition titled Scene, delivers forty minutes of controlled molecular settling. Four beautiful and ethereal tracks, with all boundaries removed. Even though these sounds warm the heart, in the crevasses of this sonic blanket, there is a sensation of sadness. Extremely difficult to explain how or why this emotion exists, but it is there. The sublime caliber of Hatakeyama's work on Scene, is the gentle brushing of sentiment form distant spirits. Forgotten souls with full lives, now disintegrating memories as time churns forward. These tones hold strength, the knowledge of all who were here before and those to follow. Our moments are precious, and Scene exposes how fragile existence truly is. MANAS is live on this recording from late last summer. Recorded at Fresh Produce records in Macon, Georgia. The label curator for \\NULL|ZØNE//, Michael Potter, is noted as the person capturing these sounds. This makes sense since the \\NULL|ZØNE// headquarters is just an hour and a half away in Athens, Georgia. MANAS is the combination of Tashi Dorji and Thom Nguyen. Both artist talented in creating sounds on the thresholds of what listeners understand. It is difficult to describe music on the fringe, and in this case, a live recording only heard on cassette. Especially one so intensely performed. The best way to make a connection with these sounds is to keep a simple focus. Live At is a shattering performance utilizing percussion by Thom Nguyen and some form of strings by Tashi Dorji. Through the course of the thirty minutes recorded on this cassette, sounds take on all perspectives. From sustained heavy rhythms and crashing patterns of stringed riffs, to an inferno of cacophony. There are moments when the aural landscape quiets. Heard from somewhere in the distance an old bell ringing or some loose piece of metal colliding in a repetitive manner against a resonating source. Then listeners are transported to the cause, what was intriguing now becomes close to terrifying. So adjacent to the origins of creation, the sound wave fervor bestows effects causing paralysis. Like sonic predators, Tashi and Thom emit hypnotic pulses, causing thoughts to recoil and hide deeper within the consciousness. The process cycles and those with fortitude inch forward to a different enlightenment. As noted before, cassettes are released on the Athens label \\NULL|ZØNE//. 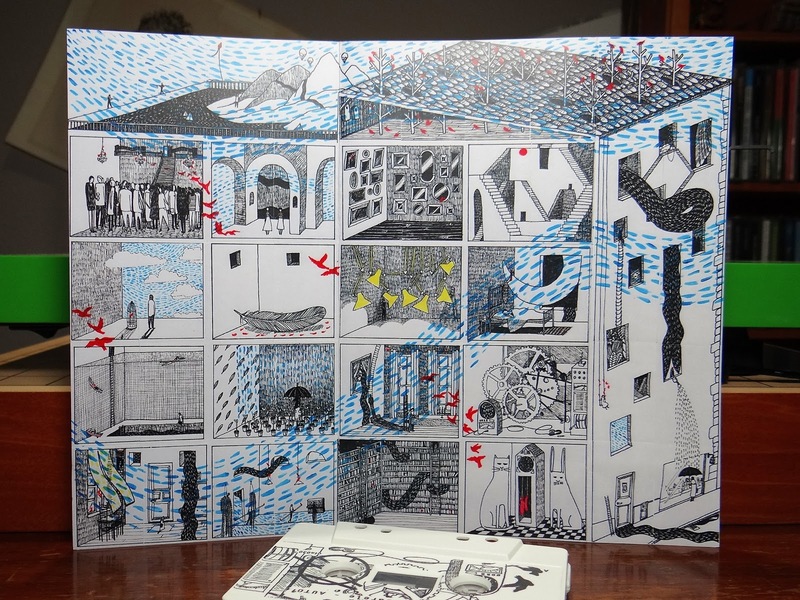 In an edition of one hundred, copies are still available from the label's bandcamp page. 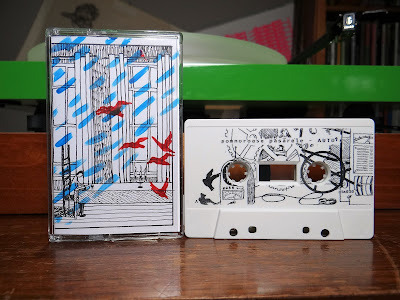 MANAS has vinyl out there on Feeding Tube Records and a few previous cassette releases. Tapes seem harder to come by. AUTO¹ is a confluence. A myriad of experiences funneling through eight tracks. Listening back on previous Somnoroase Păsărele accomplishments, it is easy to tell we have not been here before. This aural landscape is dense with sound thickets. Somewhere behind this new flourishing growth is a substantial resonating source. Origins of rhythms and irregular beats need to be verified. Music scholars are amassing an exploratory party in hopes of further deciphering these foreign signals. Each track in AUTO¹ is simply titled AUTO and then a number. Even though there are starts and stops and with a nomenclature of separation, AUTO¹ is not really a compilation of tracks. This release is one fluid source. As the body of work deepens, more tributaries of sound augment the flow. AUTO¹ holds feelings of intensity. The melodies are crystalline, every angle in sound can be heard in definition. Most of this revolves around Gili Mocanu's creativity and experience. Both the recording and production are also of a new high standard. Clearness and precision in sound is something noticed on other labels with releases this year, and AUTO¹ could be the best example to date. Miru Mercury works with Gili organizing the multitude of details for each new label release. Together they cross continents with deliveries on some of the best labels out there. For this newest body of work, the production should be noted as spectacular. Somnoroase Păsărele uses sounds with an impressive clear understanding, like a dictionary is just casual reading. The rhythmic eddies spin with articulated velocity. Small sound currents emerging from the immense surge, gently colliding with rhythmic rotations already in existence. Gradual and almost undetectable, the melodies disperse, leaving space for the process to continue. AUTO¹ is an utterly mechanical other world, but from obvious distant origins, this is a natural system. Almost ended this description without a word on how creative the artwork is on AUTO¹. Maybe this should have been at the beginning or included at each juncture, but will adhere to saving more goodness for last. Each of the fifty cassettes produced have individual covers. All of the cassettes together make a whole piece. A poster of the entire picture is included with each purchase. 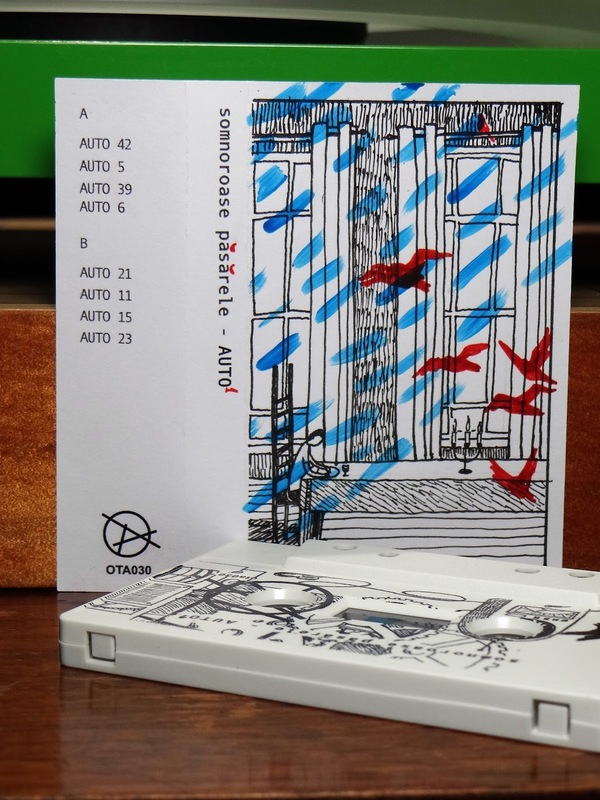 Every cassette owner will be able to see what portion of the picture they have on their tape cover. This vibrantly captivating drawing was created by Katri Virtalaakso. The artwork and music are tangled, elevating each other to become something greater. Starting off this description was the word confluence. 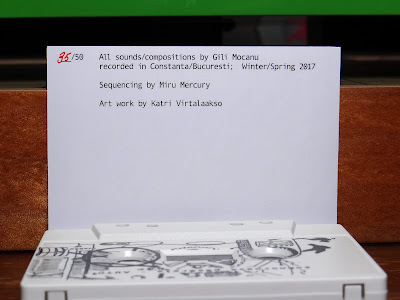 This holds true as all of the individual sounds by Gili flow seamlessly together with the intricately diverse drawings by Katri. 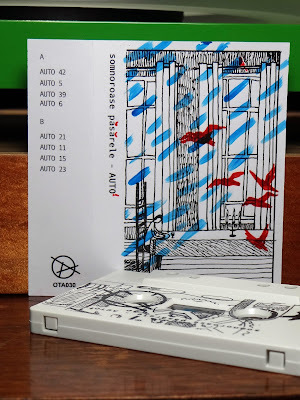 Released on the impressively cool label OTA from Portugal. AUTO¹ was in a small batch run of fifty editions. Many of the OTA releases are in this quantity, but some with only thirty. The quality of artists is high and limited number of physical releases for each is low. Together, making a very good chance for the cassette you have had your radar on, to be gone before you know it. Most Somnoroase Păsărele releases sell out quickly, so do not wait on AUTO¹. In the recesses of thinking minds, infinite amounts of signals are relayed. Either physically or in some psionic methods yet to be understood. The processes concern tranquil harmonies from wise old souls, memories of lifetimes of experience, decisions for the future and meditation in the present. The mind is the greatest machine still masking how it truly functions. S. Oliwa has connected sound to the intricate synapses of the consciousness. The subject in this case, a content being who strives for the path of higher vibration. The result, an exquisite soundtrack to a world each of us has and holds precious. Lost Memories expands horizons over eight tracks in the course of a half hour. These sounds are the most inner workings of fabric holding each of us in place. Like a distant land never seen before yet so nostalgic when finally traveled. S. Oliwa has a special ability with channeling serene harmonies through the infinite inner space. Maybe some distant descendant of Kharon the ferryman, only bringing the forgotten world to us, a transposition from ancient mythology. Each track holds genres on subtle spindles, all patiently turning, casting only elegance in one aural direction. Together these sounds build from roots planted in the past, recognizable styles and influences forging through the temporal viscosity. A composition that will be difficult to remove from the cassette deck. Released on Geology Records in April. This batch took a lot of effort to make. All handmade boxes with slide out access. Beautiful booklets with photos and notes. There are fifty in this edition for Lost Memories. There might be on batch left, but no worries if not, there are still individual copies of this S. Oliwa cassette available. Deep into the far reaches of cosmic creation, The Last Ambien Hero maintains momentum. In motion long before and far after the existence of our human civilization, Traveling a pathway through the galactic center, light intensity is to immeasurable to record. Sound becomes the true medium to collect and process this physical realm, Now stored here on this extensive analog recording. An hour and a half of deep intrigue divided by the flip of the cassette. Two side long pieces titled Cassini and Trappist -1. Both tracks in reference to man's discovery of the space beyond. Textures in sound smoothly carved in vibrant arcs light years long. Ending abruptly as singularities pull with increasing force. As the sound disappears, voids are filled with meandering waves, some crystalline and others beyond our knowledge. The process repeats as the listener reaches and passes through the galaxy's orbital axis. Traveling now in empty and lonely space. A quiet ensues, sounds are astronomically spread apart. The consciousness constantly absorbing ancient harmonies, an omnipresent otherworldy resonance that seems primordial and instinctive. This is the serene delight comprising the entire composition by The Last Ambient Hero. On approach to the end of sounds, the galactic fringe, is juxtaposed with the beginning. The start of life in it's expanding contours. True beauty in every minute detail spaced across time. Tap Water takes control for the cassette's flip. Ian Franklin & Mike Haley join consciousnesses, an astral projecting sling shot into obscured realities. Pummeling sonic debris resonating against the protective shell of droning focus. Tap Water keeps on path, reaching beyond tangible disturbances. Now minds are unfolded by higher vibrating entities, the process revealing an aura of infinitely extending light threads. With ears resting on the ambient substrate, this aural spectacle can be heard through each passing generation. A sonic foray greeting immutable wairua, molecular distances discarded with little relevance. A scattershot of flurrying melodies to be heard only at the correct times. Released on the Minneapolis label Lighten Up Sounds. Forty Four hand numbered editions destined for a complete dispersing in the cassette continuum. Lighten Up Sounds is granite in the mountain for past and future sonic goodness. Crystal clear water reflecting and transparent simultaneously. Resting not in a hidden place, only difficult to find. II sentiero degli Dei needs ample time to be really heard. The aural landscape robust with heavily woven tones. Find the path then travel with open consciousness. What seems dark is actually gorgeous depth. Listening quickly without patience reflects absorbing grey tones. Slow the pace, this half hour rapidly becomes too short. Molecular density perfectly described by sound. Fabric holding the landscape is uprooted, ground water seeps in filling the indentations. This asunder ground looks like devastation, but after closer scrutiny, life blossoms where trees once were. La Tredicesima Luna has the unique ability to make sounds so forlorn, and at the same time, wrap minds with a tranquil blanket of warmth. Two side long pieces in an opaque delivery. Drone burning ancient glowing embers adding fortitude and flickering light to the emptiness beyond the shadows. Thoughts gather and flow into a sparse collective only a few reside. Ushered by a natural essence so elusive to describe. There is patience here, an aura of old souls, energy dancing on the fringes of measurable reaches. Do not overthink these sounds, they are the currents we all travel. Released on Lighten Up Sounds in the fall of last year. Unsure of how many are in this edition, but this does not matter since the label has sold out their physical copies. Lighten Up Sounds from Minneapolis has a serious grip on the infinite sound spectrum. Selling out most everything, be sure to check their main site for physical copies if they are not available on bandcamp. There are a few tapes for sale on discogs as well. German Army combining forces with Dunes producing Germ Class. This beautifully produced and packaged compact disc on Dub Ditch Picnic brings the sold out world of cassettes and compact disc back and more massive than before. 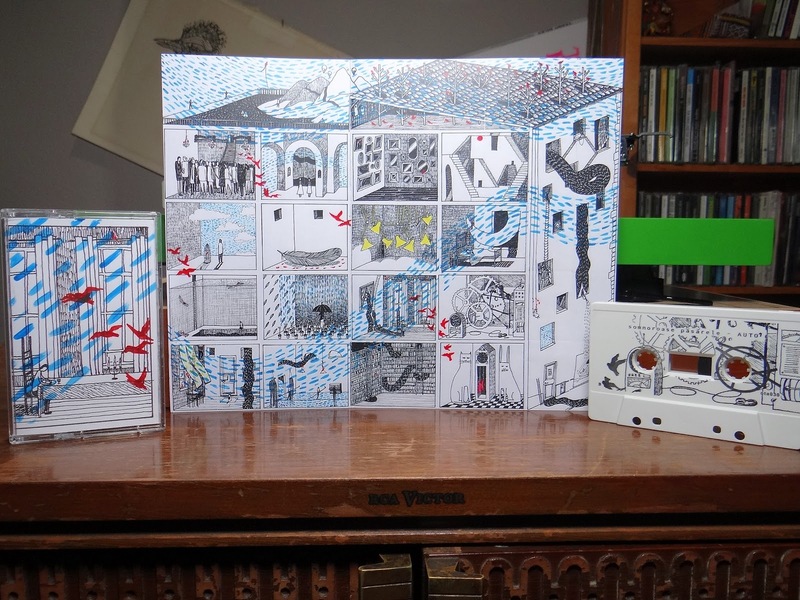 Bitter Values combines two earlier works by Germ Class, the first on the Portugal label OTA. 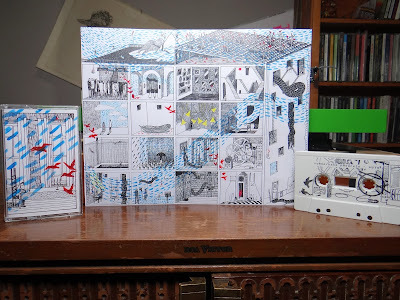 A limited run, at the end of last year, of fifty cassettes titled Dimensions of Value. These quickly sold out. The second portion of Bitter Values consist of a an earlier 2015 composition titled Eat Bitter. This was released on cassette by the label Night People and also on CDR by Subsist Records from Valencia, Spain. Hard labor over lifetimes, engines churning, natural light kept out, particulates in the air kept in.... Blank faces performing monotonous duties until injury or age keeps them away. These are the motions of slow mechanized beats, electronic processes only natural in the contained environment they exist. This is one portion of the sounds making Germ Class. Eventually the structure deteriorates, beams of sunlight expose thick stale air. Eyes looking up, averting from decades of fixed focus. Voices are heard , human or ethereal, hard to discern as the machinery still trudges on. The cloud of unconsciousness thought begins to lift. Struggle results. Living in a world of daily toil and not knowing is worse than knowing there is beauty outside the confines. This is Bitter Values, a paradox in sonic form. Genres colliding in a massive impact. The expected outcome would be a tangled catastrophe, instead intriguing seductiveness in a lengthy outpouring. This compact disc is released in an edition of three hundred by the long lived label Dub Ditch Picnic. Available from the label's bandcamp page. There is a lot of music there, so don't get lost. The slow drip of a water droplet filled with primordial minerals. Descending with the force of gravity, a stalactite is slowly formed from the cave ceiling. Molecules depositing material on the cave floor produces a mirroring image called a stalagmite. Like an icicle rising from the ground, reaching to touch the point of origin of it's creation. Occasionally the special occurrence of the stalactites and stalagmites connect and column is formed. The entire grandiose natural wonder is sometimes referred to as a cathedral cavern or ceiling. How does this geologic formation connect with Scrateboard's cassette tilted Your Hand? Absolute patience is the foundation, inverted sounds reversed in time, only showing their notes when light is cast upon them. Your Hand develops using processes only measurable in geologic time. Massive amounts of energy compressed and held tightly. Sounds reaching molten temperatures, escaping with a warbled fever. Ancient notes regenerating in the continuing cycle the planet adheres to. A total of six tracks running through about forty one minutes. As in the cavern's analogy, the melodies in this aural expanse are difficult to map. Sounds casting sonic shadows closely resembling their physical origin. Harmonies turning backwards, releasing listeners back to the place they started. This is an undisturbed composition, serenity resting for lengths of time that are still unknown. Morgan Fox from California's capital city, is the creative force behind Scrateboard. 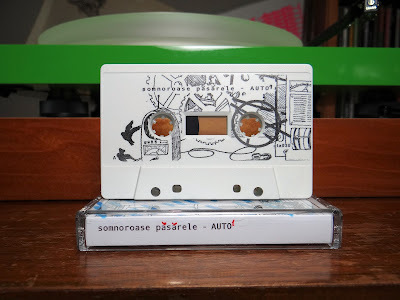 Cassettes are available from the PECONIC Records from San Francisco. Your Hand was released in an edition of fifty. Copies are available from the label's bandcamp page. PECONIC has some very great releases and is completely worth time to explore. The sounds of Sputnik 1 still travel in space. Overtime, met with alien responses, dialogues deciphered, originating location probed. Like an emergency beacon gaining the ocean surface from a submarine in trouble, satellites float just outside the atmosphere sending locations to unknown space. The arrival of kind help or the curiously malevolent is a fate set in motion almost sixty one years ago with the first Russian launch. Now, with Grant Evans recordings of Vessel, there is proof uncharted life has recorded our existence. A mechanical process in repetition over countless life years of travel. Warbled noises droning through, fluctuating radiation levels augmenting activity. On this composition titled Vessel, foreign bleeps and signals tangle in an otherworldly symphony. The aural fields have been replanted by a strange settling force. Discerning the timbre of these sounds needs care and careful listening. A collection of harmonic fluidity balancing on the frail edge of comforting and disconcerting. A total of six tracks on a forty five minute cassette. A sublime blink in the vast musical outpouring of Grant Evans. Very nice to hear how so much experience has beautifully branched, like a twisting live oak. Scheduled for release on May 18th, cassettes can be pre-ordered from the Athens, Georgia label \\NULL|ZØNE//. Painting with a very wide brush, \\NULL|ZØNE// has an extensive variety of sounds in their releases. A good place to explore and keep an ear on for the future. Nice to see Georgia alive and strong with higher consciousness.